to Dublin or do you want to plan a trip for someone else? Well, there are lots of things to do in Dublin, way more than you would be able to cover even if you stay in Dublin for two straight weeks. The sheer richness of culture, historical places in Dublin and unique Dublin things to do makes it a prime location for visits. Do you love history and enjoy visiting historical sites? If your answer is a resounding “yes” , then this article is for you and so is a trip to Dublin, Ireland. In Dublin, Ireland you would find that there are so many historical sites that tell stories of a time that existed way before us. One of such places filled with a lot if history and character is the Presidents Residence. The President’s Residence is one of the top 10 Free Things to do in Dublin. Known as Áras an Uachtaráin in Irish, the Presidents residence is the white house of Ireland. It is not just the home to the present president of Ireland but also his entire workplace. It was previously referred to as the Viceregal Lodge . It was built at the Chesterfield Avenue, Phoenix park. Here are some important facts about the Presidents residence and you need to know a bit about the place before you make the trip. The Áras an Uachtaráin is the home of the Presidents of Ireland and has been the home of the Presidents of Ireland since 1751 when it was built by Nathaniel Clements. At first, the designs to the house were bought by the then Lord Lieutenant of Ireland, who converted it to one of his residential buildings. It was known as the Viceregal Lodge because it was only used by the Lord Lieutenant of Ireland during the summer months. The Presidents Residence for all of its old look is quite grand inside. It is a huge and beautiful place with a total number of 95 rooms and official offices and state rooms for the President. In 1991, the Presidents residence underwent a renovation and extension in early 1991 because of the impending visit of the Queen Mary and George V. Many British royalty part from Queen Mary and George spent time in the Presidents Residence while visiting from Britain. In 1922, when the Irish free state was established, it disbanded the position of the lord Lieutenant and then brought in idea of a governor general. At first Tim Healy, who was appointed Governor general refused to stay at the Presidents residence but was soon forced to take cover there after his life was threatened. After Tim Healy, the Áras an Uachtaráin remained the official residence for the Presidents until 1932 when Domhnall Ua Buachalla was kept in a hired mansion somewhere in South Dublin. After a while, the Presidents house was left unoccupied for a couple of years until the first president of Ireland, Douglas Hyde was sworn in in 1938. He did not stay stay long in the Presidents residence before the world war 2 began but while he was in office, a movement to tear down the original presidents residence and build a new presidential palace was begun. By the time the war ended and renovating the entire residence was reconsidered, it was decided to let the old building stay but modernize a whole lot of it by tearing down the really bad parts and rebuilding them. The Phoenix park, home to the Presidents Residence and the residence of other important members of the government, was a scary prospect in 1882 when there was a mad killer on the loose who loved to target the High profile workers on the Phoenix. Two people were victims to the vicious killer and his surgical blades. One of them was the Chief Secretary for Ireland, Lord Frederick Cavendish and his secretary Mr. Thomas Henry Burke. They were supposedly stabbed to death while on their way from the Áras an Uachtaráin to their residences by suspected members of the invisibls, a group of insurgents based in Ireland. The Presidents Residence or Áras an Uachtaráin is a little bit less grandiose when compared to the other presidential residences in the world. This does not mean that the interior of the castle is decrepit. 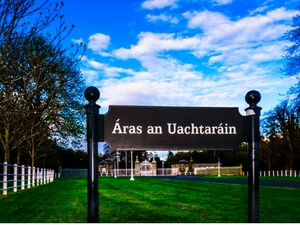 No, the Irish decided to let the history of the Áras an Uachtaráin remain alive by not destroying the original presidents residence but instead tearing down some parts of it so as to get it renovated but leaving the main house in the same design for sight seeing and to honor their heritage. OPW guided tours of the main reception rooms of Áras an Uachtaráin are available almost every Saturday all year round. Each tour takes about an hour and tours are FREE of charge. Tickets are issued on a first-come-first-served basis from the Phoenix Park Visitor Centre on Saturdays. Group and/or advance booking is not possible. The Phoenix Park Visitor Centre (01 677 0095) is open daily from 9.30am to 5pm. Tours of Áras an Uachtaráin begin at 10.30am, 11.30am, 1.30pm, and 2.30pm. Occasionally, due to State and/or Official Business it is not possible to accommodate Public Tours. The Presidents Residence is an awesome place to visit. You and your family would thoroughly enjoy making that trip and taking pictures of yourselves in the different rooms in the house. The historical home of the Presidents of Ireland for years and years should be one of the first stops you make when you get to Ireland. I hope you get to thoroughly enjoy yourself.